Yogurt, coconut and chopped chocolatey sandwich cookies are layered with fresh berries to make these easy but scrumptious dessert parfaits. 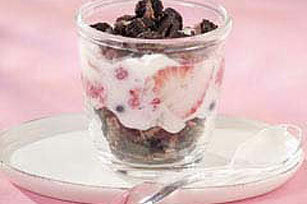 Toss berries with yogurt and coconut until evenly coated. Reserve 1/2 cup of the chopped cookies for garnish. Layer remaining chopped cookies and yogurt mixture in six 6- to 8-oz. parfait glasses or dessert dishes. Serve immediately. Or, cover and refrigerate up to 1 hour. Sprinkle evenly with the reserved chopped cookies just before serving. Garnish with thawed COOL WHIP Whipped Topping and additional cookies and berries just before serving.